Rocking the house… and the boat. A conductor of near-rock star status, Gustavo Dudamel brought the Simón Bolívar Symphony Orchestra of Venezuela to UC Berkeley last week for two sold-out performances and a host of workshops and events. Presently a 200-strong professional touring orchestra, two years ago this was the Simón Bolívar Youth Orchestra, but its members are growing up—they currently range from 18 to 28 years old, and are complementing their youthful zest with incisive musicality. Cal Performances proudly hosted their residency, and in so doing it may have raised fundamental questions on social action through music—not only questions on the future of music education in this country, but the use of music education to better lives and lift people out of poverty. How could one program in one small country so rock the world? Venezuela, over the last thirty years, has quietly engineered a program, nicknamed El Sistema, which promises to be a force for social change, and is beginning to have an impact around the world. In a country where 60% live in poverty, Dr. José Antonio Abreu began with eleven students in a garage with private funding. Today, the State of Venezuela helps to fund a massive program of music education, with 15,000 teachers and over 270,000 students, reaching out to every favela, hamlet and ghetto of Venezuela. Despite Venezuela’s turbulent political history, high corruption, and dismal crime rate—the highest in the Western hemisphere—there is a groundswell of public support for Abreu’s program, one that teaches both personal discipline and a spirit of harmony and cooperation. “The values that are introduced to the children, is that they live in a community that operates with solidarity, so that the orchestra becomes a school of social living. And the other value is that the community works and marches towards a common goal, a social goal…” stated Dr. Abreu in a recent interview. Dudamel, a product of El Sistema, rose to become conductor of their premiere orchestra, and led them to the BBC Proms in 2007 to sudden world acclaim. Three years ago he also was chosen as music director of the Los Angeles Philharmonic, but continues to rehearse and conduct his fellow Venezuelans. At Friday night’s concert, the love and respect between conductor and musicians was palpable. They opened with vivid colors. Chaac, the Mayan god of rain, was the subject of one movement from Esteban Benzecry’s Rituales Amerindios. Part invocation and part jungle rustlings, the modern treatment translated ancient heritage into a powerful present. It was surprising that such a huge orchestra could enter so quietly. An electric hush gave way to the soft clatter of sticks, and then bassoons breathed a note that trembled their depths. Flutes descended past each other, lingering on the piquancy of tight dis-unions, and then a throaty hum filled the air, almost like a didgeridoo. Gradually, the orchestra filled in, tight for such a large ensemble, painting a land of thirst and water. Violins, mono-tonal in that sere soundscape, shaped dry notes until a distant storm of horns built and shook the stage. And then horns and drums died out, leaving only bass rumbles. Flutes skittered, birdcalls that announced the gentle approach of the god, and as their echoes died, a rain tube spilled its first drops. That “atmospheric” work presaged two collaborations between the 200 members of the SBSO and the UC Berkeley Chorus and Pacific Boychoir. The rear curtain was raised and an additional 150 voices crowded onto the stage for Heitor Villa-Lobos’ Chôros No. 10 and Antonio Estévez’ Cantata Criolla, completing the all-Latin American program. This was a fruitful collaboration and showed off the fine workings of several elements. First, this program celebrated a New World spin on Euro-centric music. Full of the vigor of Latin dance rhythms and indigenous colorings and inflections, these composers fabricated their works around classical canons. Additionally, this was a chance to see musicians in the prime of their passion, absolutely intent on making great music together. But unlike the gray seas of typical symphonies, this group was sporting full heads of dark hair (including Dudamel’s vigorous mop) and many strapless black gowns. And lastly, it was an opportunity to see the legendary Dudamel in action. There was a boisterous Venezuelan contingency in the audience, and they called out “Viva Venezuela!” and waved flags at the beginning of the concert. At the end, they started clapping in unison until all were demanding Dudamel’s return. He did, and they performed the Pavana movement from Julián Orbón’s Tres Versiones Sinfónicos, performed at the Thursday night concert. Their delivery was sharp, and the remarkably big sound was succinctly stated. After more ovations Dudamel turned to the audience with a hand cupping his ear. Satisfied with a suggestion shouted from the balcony, he turned to the orchestra and spoke a title. Violins delivered incisive strokes with a cha-cha inflection and the audience sighed approval, but when a percussionist raised his maracas many in the audience started screaming. They recognized “Alma llanera,” an unofficial anthem and a poem of beauty. It is often sung to end a gathering, and Dudamel turned and sang with us, as violinists swayed in rhythm and trumpets twirled in the air. It was a moment of triumph and love that rock concerts dream of. 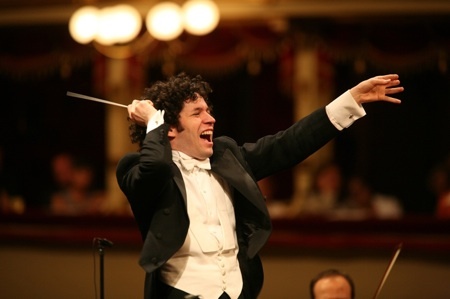 Photo of Gustavo Dudamel conducting the LA Philharmonic; photo by Sylvia Llevi.